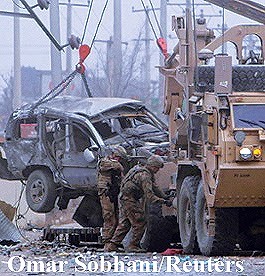 Obama, DOD attempting to hide U.S. casualty numbers by labeling them "Foreign Troops"
A suicide car bomber attacked a convoy of international troops in an eastern district of the Afghan capital Kabul on Friday, killing three service members and wounding six Afghans, officials said. A Taliban spokesman, Zabiullah Mujahid, said the insurgent group was behind the attack. Television images showed remains of the exploded car in the street, and several armoured vehicles stopped nearby. The bomber struck the convoy about half a mile from Nato's Camp Phoenix base, according to a Kabul police spokesman, Hashmat Stanakzai, who reported the Afghan injuries. The International Security Assistance Force did not provide details on the identities or nationalities of the three service members killed. Twelve coalition troops have died in Afghanistan so far this month, including six US soldiers who died in a helicopter crash on 17 December. So far this year 151 coalition troops have been killed in Afghanistan, according to a tally kept by the Associated Press.